The natural beauty of the forest as the Fall season is in full swing and Mother Nature's miracles turn Algonquin Provincial Park in Ontario into a splash of hues. Every season enlightens Algonquin Provincial Park in Ontario, Canada but Fall seems to take precedence as the leaves on the trees turn the forest into an array of colors. The drive towards Rock Lake is particular pretty as the forest highlights the sides of the road and the Fall colors surround you. 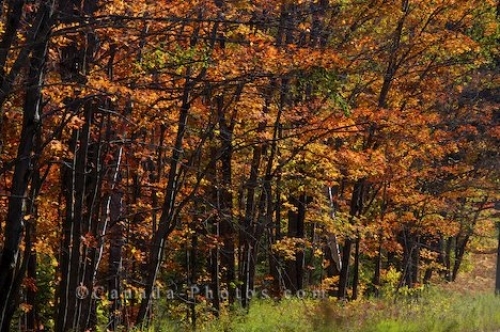 Picture of the forest during the Fall season along the road to Rock Lake in Algonquin Provincial Park in Ontario, Canada.